Actually, they don't! They look normal - but that's what they look like if you accidentally have your camera on the wrong setting all weekend! 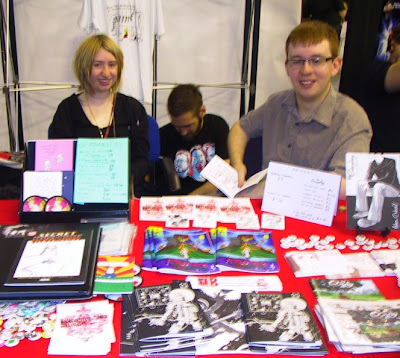 But blurry or not, that's where we were, selling copies of the Demon Tomato to unsuspecting passers-by, as part of the Manchester Comix Collective table. Here I am at our table, along with Lizz Lunney. I hadn't met her before, but when I was reading through her comics I giggled so much she thought I was making fun of the customers or something. Not pictured, Adam Cadwell and Chris Doherty, who were both there and had comics on sale (also brilliant - an autobiographical comic-strip and a high-school murder-mystery B-movie homage story (did I get that right Adam?) respectively), they just weren't actually sitting there at that moment, and Abby Ryder, who was drawing sketches of superheroes for people and taking pictures of us. 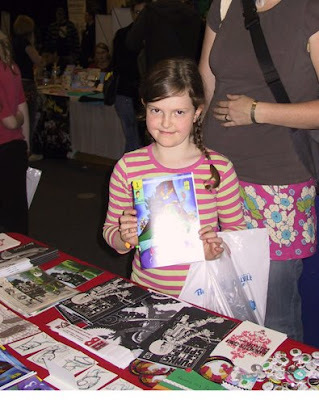 She came and spoke with us for a while about how she hadn't been interested in comics until recently, when she'd seen some of her brothers' comics and thought they looked pretty good. Then she went looking round the whole con, and eventually brought her family back to us to pick up a Demon Tomato. Now she's got her own comic and doesn't have to peer over her brothers' shoulders any more. You never know, she might think it's really rubbish - but she didn't seem the shy type. I'm hoping if there's anything she doesn't like about the comic, she'll march over and tell me what it is, and help me make the next ones better. So, thanks to everyone who stopped by our table and bought a copy of the comic, and of course to everyone who bought other Manchester Comix Collective things as well. The aim is to get as many people looking at our work as we can. 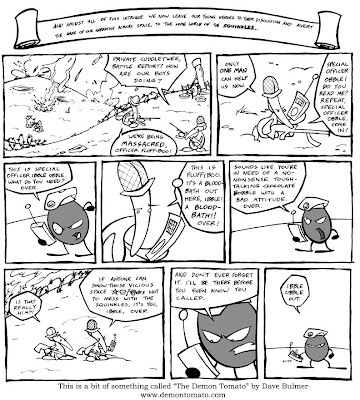 Demon Tomato: YOU CAN READ IT NOW. 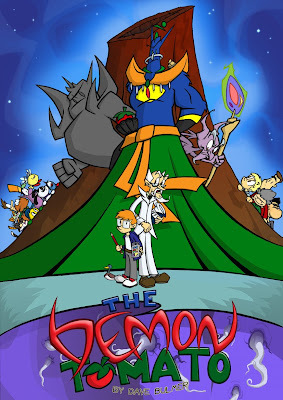 The Demon Tomato is finally on sale, and it's in all sorts of places should you wish to read it. Travelling Man, a chain comic shop that's all about being bright, airy and family-friendly as opposed to dark and dungeonesque. There are a few of these shops dotted about, but Demon Tomato is currently stocked in the Manchester and Newcastle branches. If you're actually bothered enough to do this, you can also ask the staff to call the Manchester branch, who will happily send them a copy for you. They're really pleasant, try it. Even if you don't want the comic you should try it, just so you can see how nice they all are. Plus you should read the comic. The other place you will find Demon Tomato is the Birmingham International Comics Show! It is happening on Saturday and Sunday at something called the "Think Tank". You'll know it because it's a great huge building somewhere near the train station with "THINK TANK" written on it, and lots of people in Decepticon T-Shirts walking to and fro around the perimeter. In fact, if you spot any obvious geek parties anywhere in Birmingham, follow them, you'll end up there. I have done this before, it works. You'll find this comic on the Manchester Comix Collective table. Now, assuming I'm right about having no readers (and why should I have, I don't know how to get any and so haven't done it), you won't be reading this until the con has finished anyway. So that's an opportunity missed. But there's still that web link and the Travelling Man shops. So keep an eye out for that. 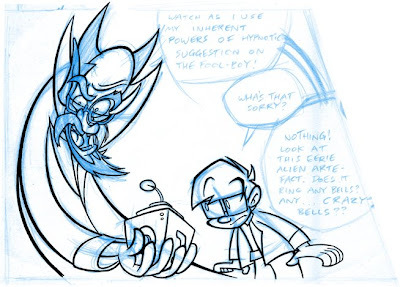 And in the spirit of giving, here's a work-in-progress panel from issue three, which has a drawing I'm particularly fond of, a very bendy picture of the comic's main villain, Mister Cherrycrumble.